For the last five years James and Deborah Fallows traveled around the country in their single-engine prop plane visiting more than 29 towns and cities (including in Mississippi) to “look for America.” In a time when America seems to have been rent asunder, the Fallows found realistic optimism and pragmatic cooperation on their hopscotch journey across the country, and met individuals of all stripes willing to tackle social and economic challenges one problem at a time together. They talked to civic leaders, workers, immigrants, educators, environmentalists, artists, public servants, librarians, business people, city planners, students, and entrepreneurs to take the pulse and understand the prospects of the places in the middle of the country, that are all too often flown-over and forgotten. Our Towns is the story these people. 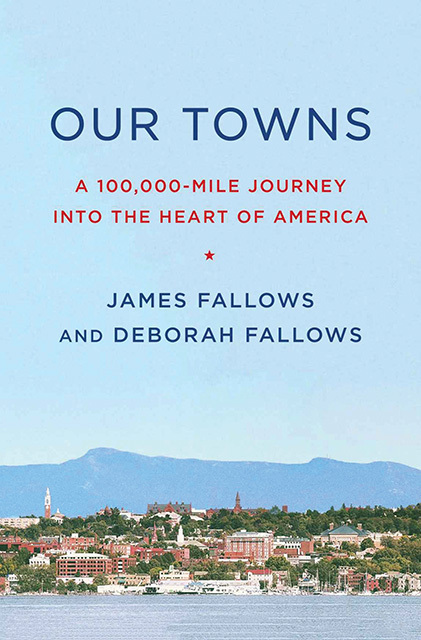 The America the Fallows found is acutely aware of its problems but is forging solutions, with a practical determination that is at dramatic odds with the divisiveness and inaction of national politics. In Our Towns, they share their view of the country that is as complex and contradictory as America itself. But, it also reflects the energy and generosity, compassion and dreams of everyday Americans who are rolling up their sleeves, are working together and are busy making things better for themselves and their communities.